The Gtk.StackSwitcher widget acts as a controller for a Gtk.Stack; it shows a row of buttons to switch between the various pages of the associated stack widget. All the content for the buttons comes from the child properties of the Gtk.Stack; the button visibility in a Gtk.StackSwitcher widget is controlled by the visibility of the child in the Gtk.Stack. It is possible to associate multiple Gtk.StackSwitcher widgets with the same Gtk.Stack widget. The Gtk.StackSwitcher widget was added in 3.10. 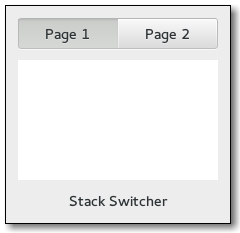 Gtk.StackSwitcher has a single CSS node named stackswitcher and style class .stack-switcher. When circumstances require it, Gtk.StackSwitcher adds the .needs-attention style class to the widgets representing the stack pages. the stack, or None if none has been set explicitly. Retrieves the stack. See Gtk.StackSwitcher.set_stack(). Use the “icon-size” property to change the size of the image displayed when a Gtk.StackSwitcher is displaying icons.